Bits of My Own: Today is my birthday . . .
Today is my birthday . . .
and oh, what a large and terrible number it is!!! Ugh! Do not know how I got here! I couldn't possibly be this old! Ok, don't think about it! Just don't think about it! Just keep going! That's it! Denial, denial, denial! Not much going on around here today. It is very, very cold here today, and windy too. Looks nice out, but way to cold to be out for any length of time. I have gone back to working on Love is Enough. It is a difficult stitch, and frustrating with back stitching at odd angles, and color changes every 2 or 3 stitches. It is quite a slow-go. I will be glad when it is finally finished. and unless you look really closely, it looks like one color. That is a bit of a disappointment. Oh well that's all I have for today. Guess I have to go back to face my grim reality! 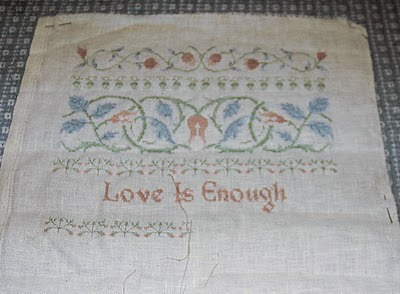 Love is Enough is looking great! Happy birthday! I do my best just not to remember how old I am. lol! I love your WIP -- so pretty! I might be a little late but Happy Birthday. What a beautiful finish you have! Happy Birthday, Erica. And enjoy your new year. The project you are working on looks great. Maybe when it's finished you can enjoy the different colour shades somewhat better. Good luck with your new bee hive. Happy belated birthday, I hope that you had a great day. How you celebrated your birthday? Im a little late with my wishes but hope you had a beautiful day. This design looks so pretty do stick with it as I am longing to see the finished result. A Bit about the Bees . . .
Country Garden part 3 is completed! Febuary was not a good month!